THE GOVERNMENT has dismissed suggestions that Ireland allow motorists to register personalised numberplates for their cars – warning that the system would be too complicated. Michael Noonan had been asked to consider the idea by Fine Gael backbencher Billy Timmins, who suggested that allowing bespoke numberplates could “cut down on unnecessary administration”. Noonan dismissed the proposal, however, saying he did not want to change the current system which allows prospective buyers to figure out the age, and registration place, of a vehicle at a glance. “It is seen as a simple and effective registration plate system which is indeed the envy of many European registration authorities, including the UK,” Noonan wrote in a parliamentary reply to Timmins. A move to a more complicated plating system, using variations of letters and numbers, could create confusion without providing any real benefits. The minister also warned that allowing a parallel system of personalised numberplates would place further demands on other agencies like the Gardaí, the government and the Revenue Commissioners. “The small size of the Irish car market, the potential for confusion and increased tax evasion, as well as the costs of administering such a scheme, raise considerable doubts as to whether any real overall benefit would accrue to the State,” he said. 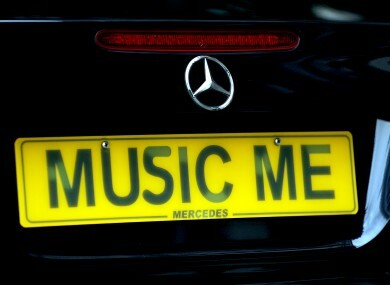 Would you be in favour of a personalised numberplate system? Email “Government rules out allowing personalised registration plates”. Feedback on “Government rules out allowing personalised registration plates”.